The Ryobi 522 is a fully-featured 2 color offset press designed specifically for top quality reproduction. 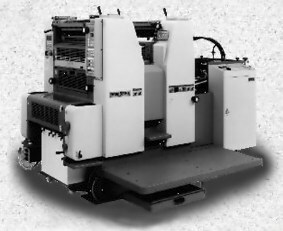 The 522 offset press performs as reliably on large solids, screens and halftones as it does on duotones or more difficult spot color work thanks to its impressive 16-roller ink system. More impressive is the way it allows excellent tight register on two-, three- and four-color work--the type that makes short work of even the toughest jobs. Its capability to print sizes up to 14" x 20" at speeds up to 13,000 sheets per hour ensure that it is fast enough to produce even the longest runs in short time.